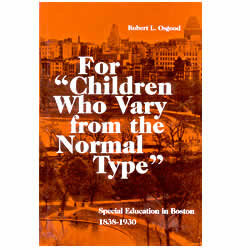 In this study of the education of disabled children during the nineteenth and early twentieth century the author focuses upon the Boston school system as both typical and a national leader among urban centers at that time. Describes the growth of Boston and its educational system during this period and examines the emergence of individual programs for students with special needs. Pages 214.